2 Brown ground beef and season with taco seasoning. add cream cheese, cover and simmer until cheese is melted, blend well. cool beef mixture. meanwhile, cook pasta, drain, and set shells out individually on baking sheet/cutting board so they do not stick together. 3 pour salsa on bottom of baking dish. stuff each shell with beef mixture and place on top of salsa. 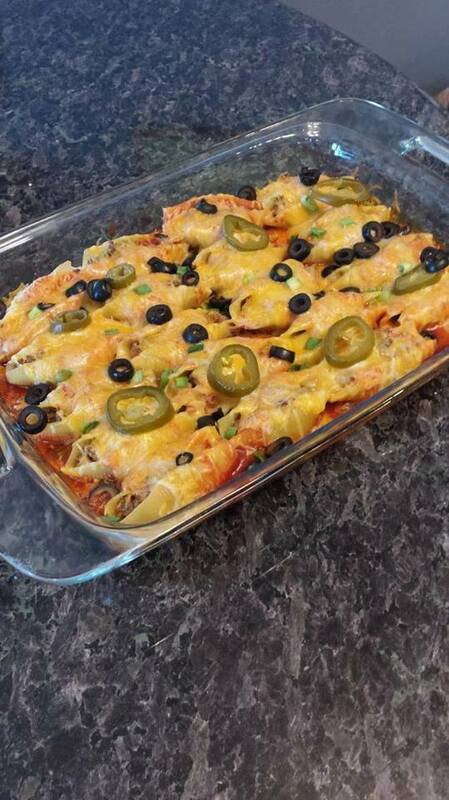 cover the shells with taco sauce, cover baking dish with foil and cook for 30 minutes. 4 add shredded cheese and continue cooking for 10-15 minutes with the foil removed. top with green onions and sour cream.